Define your lips with MUD Lip Pencils that offer long-lasting and precise results. These pigment rich pencils are soft enough to shade the entire lip, yet firm enough to line and define with accuracy. The color glides on easily to complement your favorite luscious lipsticks and glosses without feathering. Its creamy formula makes it extremely easy to blend and mix colors in order to create custom-shades. Cleans lines and precise application. Highly pigmented and long lasting . Creamy texture and blendable . Brick - A deep terracotta color lip pencil. Mahogany - A deep red-brown color lip pencil. 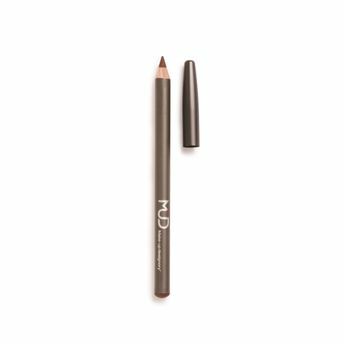 Maple - A light, neutral brown color lip pencil with a hint of peach. Mauve - A natural plum color lip pencil with a cool undertone. Natural - A light pink-brown color lip pencil. Red - A true red color lip pencil with perfectly balanced undertones. Explore the entire range of Lip Liner available on Nykaa. Shop more MUD products here.You can browse through the complete world of MUD Lip Liner .